Most hepatitis E virus (HEV) infections are asymptomatic or self-limiting. Nevertheless, HEV is considered a major cause of acute viral hepatitis which may, in immunocompromised patients, progress to chronic disease. Fulminant hepatitis was observed in women during pregnancy, and prognosis of hepatitis B-positive patients superinfected with HEV is poor. In developing countries, difficult access to safe drinking water and poor sanitation pave the way for waterborne outbreaks of HEV genotypes 1 and 2. Zoonotic transmission of HEV genotypes 3 and 4 occurs through the consumption of raw meat or direct contact with animals. Pigs are considered the main reservoir of zoonotic HEV, but several studies provided serological and molecular evidence of HEV circulation in cattle and goats. In Lao PDR, livestock are an important source of livelihood. While more than 80% of the Lao pig population are produced in the smallholder sector, pig meat demands in urban areas are mainly met by commercial production systems. The number of cattle in Lao PDR increased by 2/3 within the last decade as a consequence of the rising demand for meat in Asia. Similarly, goat production more than doubled in the country since 1999. 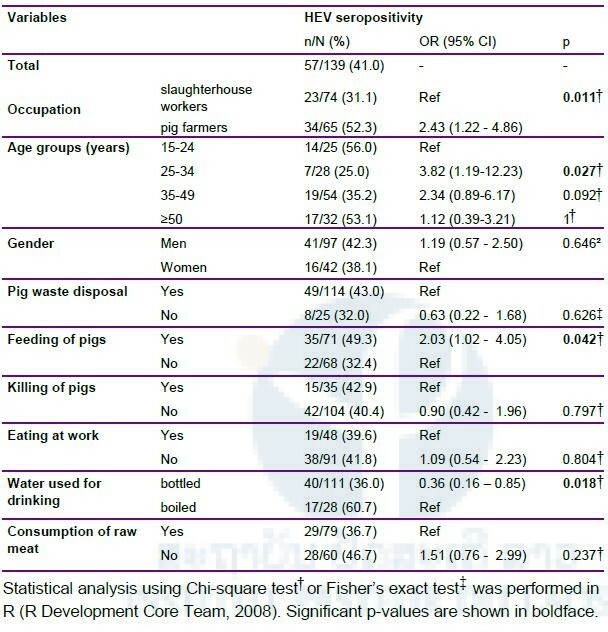 In this cross-sectional study from Lao People’s Democratic Republic, anti-HEV IgG were detected by ELISA in 54.0% (136/252) of slaughter pigs, in 41.0% (57/139) of professionals exposed to pigs, and in 18.1% of the non-risk controls (38/210). We show that people occupationally exposed to pigs are at higher risk of infection (p<0.001). In particular contact to young piglets as compared to contact to the older slaughter pigs was a major risk factor (p=0.011). Besides, consumption of bottled water significantly reduced the risk of infection (p=0.018). 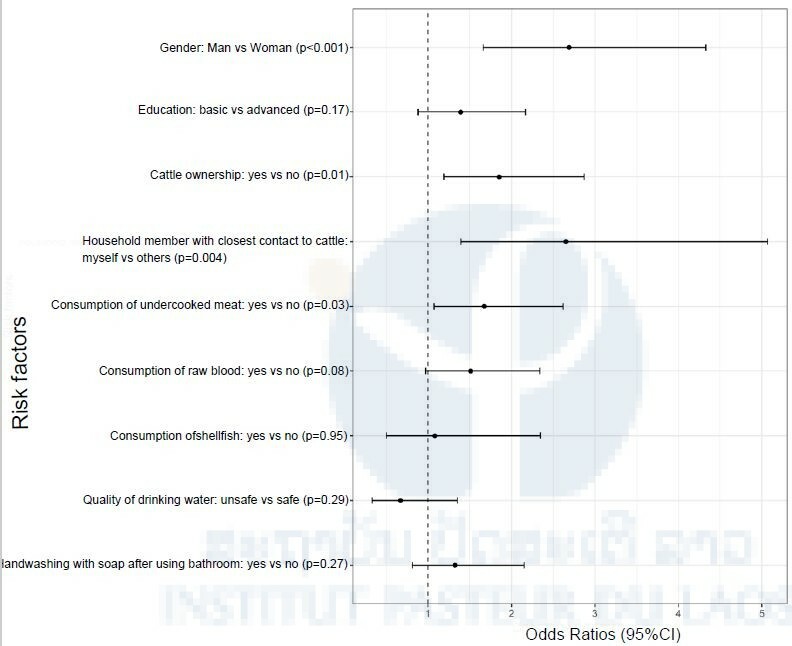 + Study 2: Hepatitis E virus exposure in Lao villagers Villagers with (n=171, risk group) and without (n=155, control group) cattle were recruited in 7 villages in Vientiane Capital. Owners of pigs were excluded. Blood, as well as information on socio-demographics, animal contact, dietary habits and awareness of zoonoses were collected to assess risk factors. Blood and rectal swabs were collected from cattle (n=173) and other ruminants (27 goat, 5 buffaloes) to measure anti-HEV antibody and virus prevalence. A similar anti-HEV antibody seroprevalence was found in cattle (6.8%) and other ruminants (8%). HEV RNA was detected in none of the animal rectal swabs and human sera. Anti-HEV IgG seroprevalence was higher in cattle farmers than in the control group (59.1% vs 43.9%, p=0.008) and increased significantly with age. Other risk factors included male gender, close contact with cattle and consumption of undercooked meat. Figure 8. Forest plot of the effect of risk factors on anti-HEV IgG antibody seroprevalence. Odds ratios, 95% Confidence intervals and p-value as estimated by Chi-square test. The high endemicity of HEV, the inadequate implementation of hygiene measures in slaughterhouses and farms, as well as the limited access to safe water jeopardize the health of professionals exposed to animals in Lao PDR. In our studies, slaughterhouse workers and pig farmers had a higher risk of HEV infection than the general population and, on village-level, significantly more cattle farmers had been exposed to HEV than other villagers. In addition, we provide first evidence that HEV circulates in free-roaming ruminants with open access to village water sources. Despite some awareness about hygiene, villagers are likely constantly exposed to zoonotic diseases by dietary and lifestyle habits. Our study highlights the need to raise the awareness of the rural population about water- and food-borne pathogens, and about the role of livestock as a possible source of infection. The knowledge gained on local risk factors and husbandry conditions should guide future awareness raising campaigns and promote appropriate hygienic measures including hand washing and the consumption of safe food and water. As HEV may cause acute or chronic hepatitis, access to safe water should be improved in particular in rural areas to reduce the potentially severe health consequences. This year we supervised 3 Master student projects from the LTPHI. The data are still being analysed and are presented here in brief. In one study, we determined the knowledge, attitude and practice of blood bank staff and blood donors towards hepatitis B virus and blood safety by surveys and in-depth interviews. Although blood bank staff had high overall knowledge on hepatitis B, blood donors had low level of knowledge. The results indicated problems about excluding repeat donors who were positive for HBsAg. 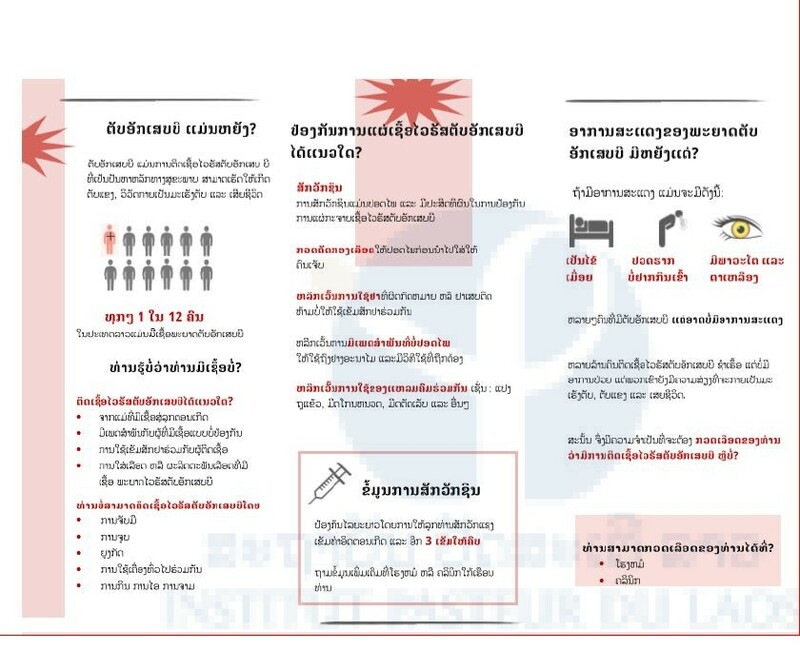 We reported these results directly to the Lao Blood bank and suggested several actions to improve the detection and exclusion of HBs Ag donors and mechanisms to increase staff and donor knowledge about HBV. 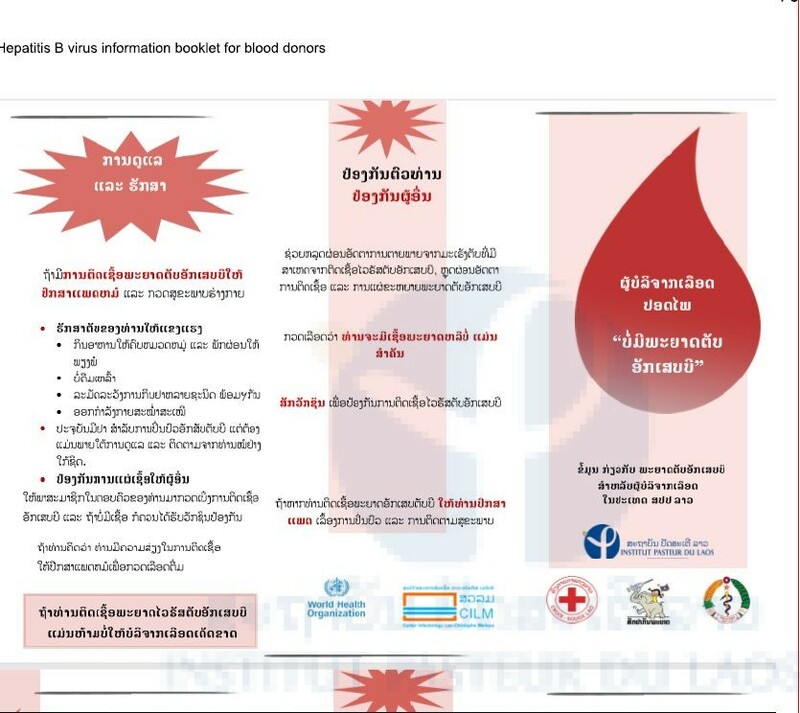 We produced a Lao language information booklet about hepatitis B virus for Lao blood donors. A second Masters project involved investigation of hepatitis B virus infection in Lao dentists. This is a sub-group of healthcare workers who are at risk of exposure to hepatitis B virus through their occupation. We conducted a knowledge, attitude and practice and serostudy in approximately 350 dentists. Previous exposure to the virus was high, as was chronic infection. Furthermore, knowledge of the disease and practice to reduce risk of infection were low. We presented these data to the Lao dental association and provided recommendations to raise awareness and improve practice among this group. The third student focused on hepatitis B virus exposure, chronic infection and vaccination status of adolescents. This age-group is particularly important because they are beginning to be exposed to new risk factors (sexual transmission) and also, they are the oldest cohort to have been born after introduction of the hepatitis B vaccine (2001 to 2004). Encouragingly, we found low levels of virus exposure and chronic infection in this age-group, compared to a previous study in the same age group that were born before vaccine introduction. 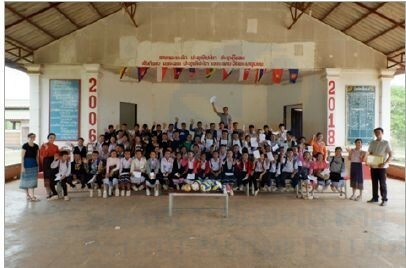 In addition, 2 students of the Faculty of Agriculture, as well as 2 students of IVET school wrote/will write their final thesis on our collaboration study about Foot-and-Mouth Disease virus in Lao ruminants. Our ongoing studies in 2018 include investigation into the seroprevalence of Crimean-Congo Hemorrhagic fever (CCHF) virus IgG in Lao PDR. This is a tick-borne virus, responsible for severe disease in humans. As the tick vectors (Hyalomma ticks) are found in Lao PDR, we aim to determine whether the human and animal populations have been exposed to CCHF by an ongoing seroprevalence study. We also continue a study in collaboration with the Children’s Hospital in Vientiane Capital, looking for evidence of transfusion-transmitted infections (such as hepatitis B virus). To date we have recruited over 350 children who have received one or multiple transfusions and will begin testing for TTI in 2019. 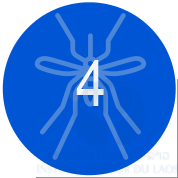 In Salavanh province, southern Lao PDR, we have a collaboration with the provincial hospital and 3 district hospitals to determine the seroprevalence of vaccine-preventable infections among different ethnicities. This project is due to end in 2019. In collaboration with the Faculty of Agriculture and IVET school, we collected more than 800 samples from cattle, goat and buffalo. Those samples will be screened using commercial ELISA kits in order to assess the seroprevalence of Foot-and-Mouth-Disease and CCHF virus. In addition, knowledge, attitude and practice of farmers and official veterinary staff will be assessed by questionnaires.